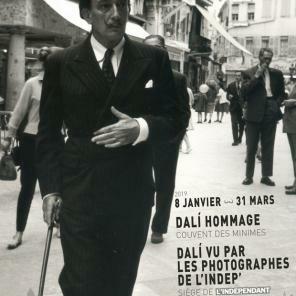 In parallel with the exhibition of 26 photos taken during the last three decades of Dali’s life by the former photographers of L’Independant hung in the lobby of the newspaper (free entry) the City of Perpignan in partnership with our title exposes up to March 30, 2019 at Espace Dali other facets of the immortal Catalan artist. Jean-Marc Pujol, Mayor of Perpignan, officially launched this Monday evening, in the presence of many personalities from the cultural world, the press, and guests handpicked at the Dali Space of the Convent of the Minimes, the other sublime exhibition of photographs “Dali tribute” on the occasion of the 30th anniversary of the death of the Catalan painter (he died on January 23, 1989). Created at the initiative of two passionate geniuses with the mustache of Port Lligat (Cadaquès): Jean Casagran and Thierry Grillet (who also “committed” a magnificent off-series rich in photographs mostly unpublished), this exhibition retraces , signed by famous photographers: R.Argillet, J. Clemmer, Robert Whitaker, J.- Marie Perrier and others, some snapshots of the daily life of one of the major artists of the twentieth century. And stresses with force the extraordinary modernity that reflects the Dalinian work.